We typically strive to incorporate fish in our diets, especially varieties that contain heart-healthy omega 3 fatty acids. I often look for wild-caught rather than farm-raised, but that sometimes limits my choices. My favorite trip about once a month is going to the fish market to choose from an array of seafood that comes from all over the world. I grew up eating fish whole, in other words with the bones intact. 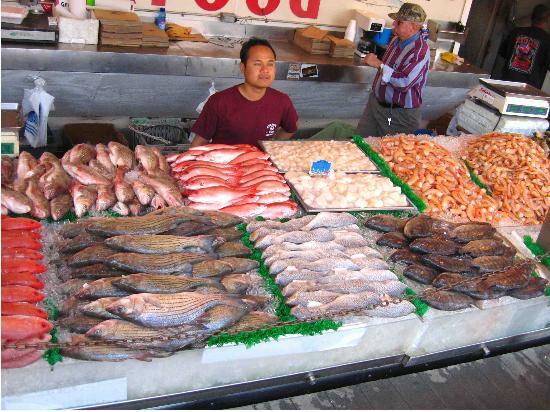 Seafood is an important source of protein in many diets around the world, especially in coastal areas. 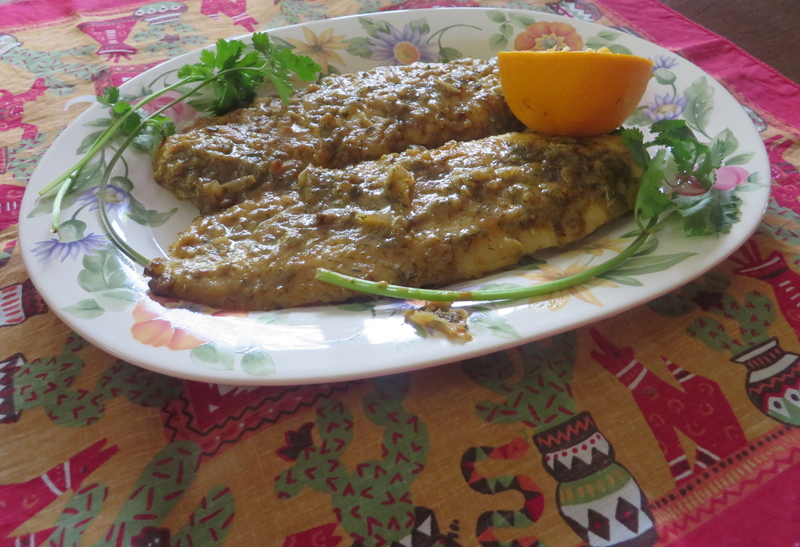 Flounder is the fish required for this recipe – it is one of the more readily available Atlantic fish. It’s delicate flavor is wonderfully balanced by the sweet and savory combination of orange, shallot and mustard in this recipe. I did not have flounder in my freezer, so made do with swai. Swai is a white-flesh fish (typically available in fillet form) with a sweet mild, taste and light flaky texture that can be broiled, grilled, or coated with bread crumbs and fried. It can be prepared simply, but also takes well to sauces. I adapted this recipe from Eating Well. 1. Mix flour, salt and pepper in a shallow dish. 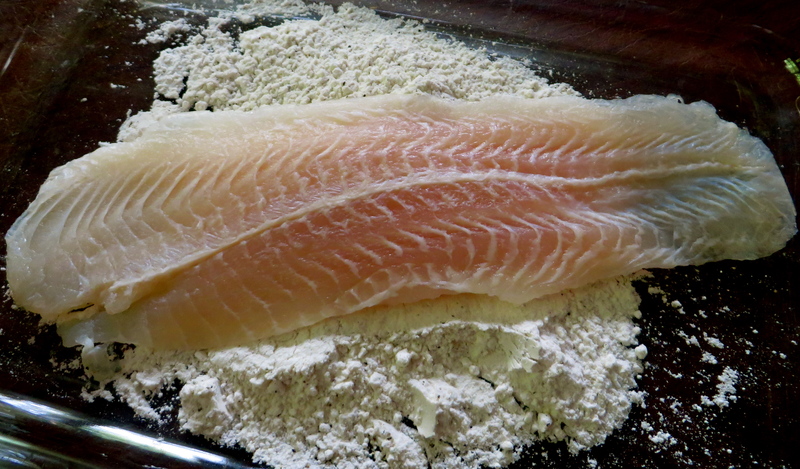 Thoroughly dredge fish fillets in the mixture. 2. Heat oil in a large nonstick skillet over medium-high heat until shimmering but not smoking. Add the fish and cook until lightly browned and just opaque in the center, 3 to 4 minutes per side. Transfer to a plate and cover loosely with foil. 3. Add shallots to the pan and cook over medium-high heat, stirring often, until softened and beginning to brown, about 3 minutes. Add wine and bring to a simmer, scraping up any browned bits. Cook until most of the liquid has evaporated, 1 to 2 minutes. Add orange juice and mustard; bring to a boil. Reduce heat to low and simmer until the sauce thickens a bit, about 5 minutes. Add butter and parsley; stir until the butter has melted. Add the fish back to the pan to absorb all the yummy sauce. 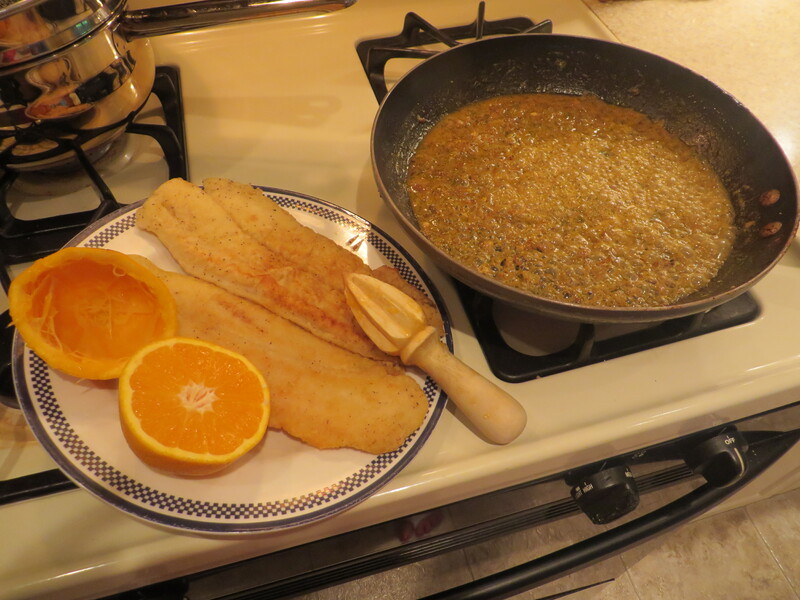 Transfer fish to individual plates and pour remaining sauce over fish. Glad you brought this Loretta! Sounds lovely! Hi, Loretta! This looks so delicious! Happy FF20 to you. Btw, I could sense that the link problem did not work? 😦 I must have been a lousy teacher. Hahaha! Ha ha Jhuls you’re right, I’ll email you again about it :). Just getting to the party, a bit late, but I’m gonna try and catch up and see what everyone has brought to the table. No worries Jhuls, I was pretty sure that you had already visited, I’ll have to re-check :). Thanks so much, you should give it a try, the citrus, mustard and wine really blend beautifully. the combination of ingredients in this dish are amazing! happy fiesta friday! Thanks Simi, and happy fiesta friday to you too. A bit late, but I’ll catch up before long. Looks delicious, Loretta! 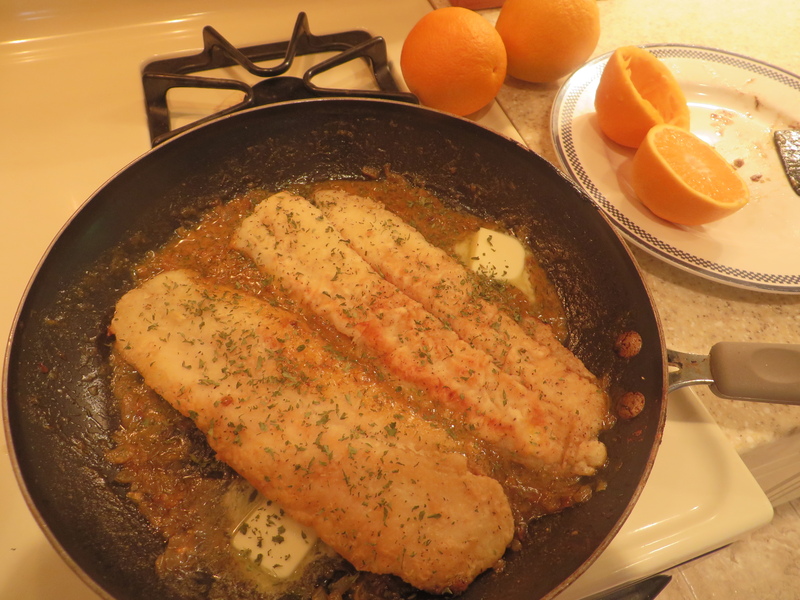 Love the combination of fish and citrus…using orange juice is a wonderful change of pace! 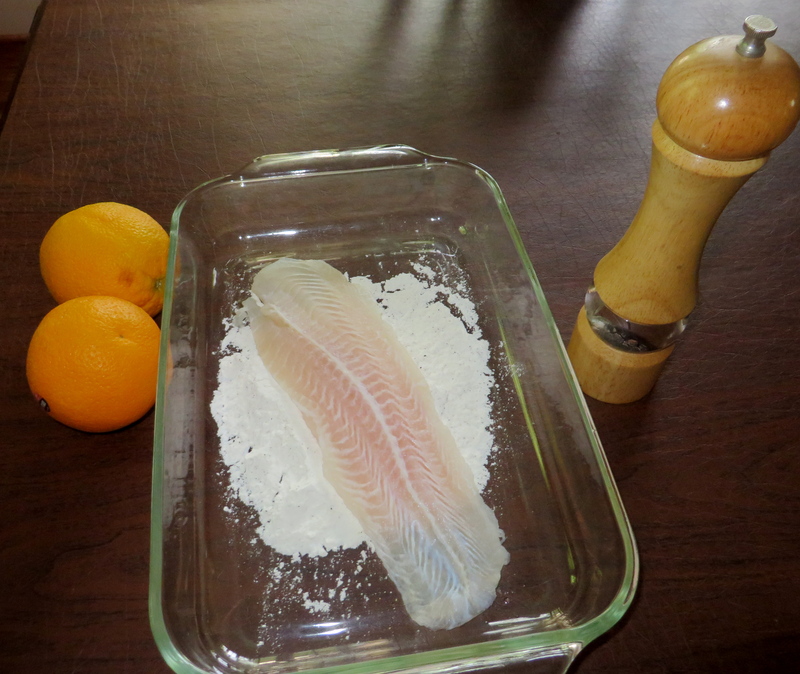 This is a lovely set of photos with your fish recipe! My usual response to fish recipes is to say ‘oh well, that’s not for me’. In this case, however, you are enticing me to perhaps try something different 🙂 ! Any delicate fish would do Selma. I’ve tried it with different types. It’s a good weeknight recipe, but you can also dress it up and entertain with it. The subtle flavors really make this pretty special. Thanks, have a wonderful weekend too. Oh thanks so much, I hope to follow your blog too. Thanks for visiting. This is a wonderful dish to bring to Fiesta Friday! So elegant and tasty! Thanks ChefJulianna, I’m glad you like it :). I love flounder this dish is wonderful, the citrus and wine and shallot are perfect with the delicate fish. Thanks for giving us such a wonderful meal at FF#20. Previous PostPrevious From a large plot to a postage stamp! Next PostNext A tasty weekend on a houseboat!